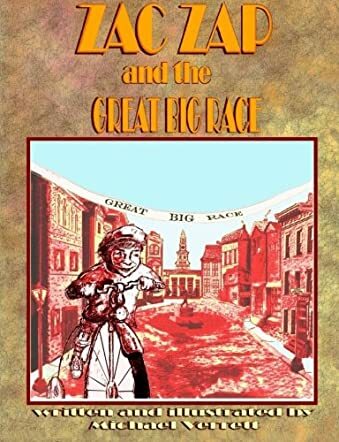 Zac Zap and the Great Big Race by Michael Verrett caught my eye because the lead character, Zac Zap, is in a wheelchair. Zac Zap was born with spina bifida which causes him not to have use of his legs. When Zac hears about a big race he decides to compete in it on an orange bicycle that he has transformed into a hand cycle. Zac Zap and the Great Big Race may be a novel for young adults but I enjoyed it. The story is an easy read and reminds me of a modern version of The Tortoise and the Hare, but it is much funnier. Verrett made me laugh with all the funny names he named the streets and businesses in the book. My personal favorite was “Big Smell’s Fish Market.” Zac Zap was an extremely lovable character. I wish I could receive one of his magical hugs. Motorcycle Girl was a little crazy in a highly caffeinated way but she had a good heart. I also liked how there was artwork throughout the book, displaying different scenes in the story. I think Zac Zap and the Great Big Race teaches people that no matter how different you are you can still achieve your goals. I also like how Verrett brings awareness to spina bifida. I do wish that we would have touched on the definition of spina bifida a little more. I have a brother who is in a wheelchair and hand cycles often, so this story truly touched my heart.